Am I A Raison Head? : The similarities between Marvin Cole, John Searl and Charles Chandler. The similarities between Marvin Cole, John Searl and Charles Chandler. 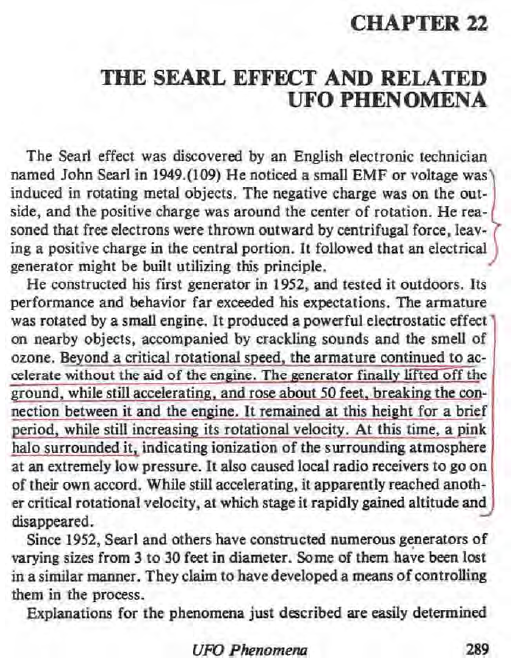 If you've been following this discussion of Tesla's Special Generator, you may have noticed that several researchers have replicated each other's works unbeknownst to each other. The electrostatically charged tornadoes of Charles Chandler's analysis replicates the electrostatically charged air ventilated throughout the Marvin Cole design of the EV Gray motors according to Mark McKay's analysis. And these first two examples replicate the arcing along the surface of Searl's spinning metallic disk. All three ionize the air. All three exhibit coronal effects. All three defy gravity freaking out Marvin Cole which led to his immediate refusal to work on the EV Gray motor anymore. At least two require rapid rotation of several thousands, or hundreds of thousands, of RPMs. And rapid rotation can be assumed of tornadoes, as well, since the interior of a tornado may not spin as slowly as its perimeter? Its core may constitute a multitude of concentric, and non-concentric, eddy currents defying wholistic coordination, but - in the end - balancing out all of their disparate energies. This makes analysis of the mechanical variety of Tesla's Special Generator relatively easy, because we have all of these inventors replicating Tesla's general idea in their own unique way. But the more advanced solid state version still eludes me for what's missing is the kinetic energy of a moving part resulting in the - oh, so - convenient separation of charge between a dipole of positive and negative charges maintained without recourse to spin? Suppose metallic spin is replaced with arcing within a partially vacuated tube of air of normal humidity? Whether or not these light bulbs contain filaments, or not, or whether any possible filaments are made of tungsten or some other catalytic candidate to momentarily convert water vapor and dinitrogen into combustible ammonia and hydrazine before reverting back into their former states in an endless cycle, maybe this could replace a spinning metallic disk? I'm looking for spin on a molecular, or atomic, level apart from any macroscopic spin which could be imparted upon small particles to replicate metallic spin previously reported on large scale objects. The reason why I suggest light as a substitute for metallic spin is because someone did an analysis of sparks as to why do they create an excessive avalanch of electrons resulting in an overunity situation?